Before his appointment as Head of the UNLOPS, Rory Keane worked for the United Nations Special Envoy for the Sahel Region and served as the security sector advisor to the UN Special Representative in Liberia. Prior to that, he was Team Leader of the OECD International Network on Conflict and Fragility, European Commission Desk Officer for the DRC and Great Lakes, as well as the OSCE Spokesperson in the former Yugoslavia. Rory Keane holds a PhD in International Relations and a Marie Curie post-doctoral fellowship on EU peace and security policy. He speaks English, French and German. Annick Hiensch is the counter-terrorism focal point in UNLOPS. She previously worked in the Departments of Political Affairs and Economic and Social Affairs of the UN Secretariat in New York, the European Commission in Brussels, and the World Food Programme in Rome. Annick holds a Master of Public Administration degree from Cornell University, New York. She speaks English, Dutch, French and Spanish. Before his appointment at UNLOPS, Kamiel worked as a Fellow for the delegation of the European Union to the UN Headquarters in New York. Prior to that, he worked at the Parliamentary Assembly of the OSCE and on consultancy basis for the OSCE Office for Democratic Institutions and Human Rights. Kamiel also has work experience at NGO level and interned at the Netherlands Ministry of Foreign Affairs. Kamiel holds a Bachelor degree in European Studies and a Master Degree in Human Rights and Democratization from the European Institute for Human Rights in Venice, Italy. He speaks Dutch, English, French and Italian. 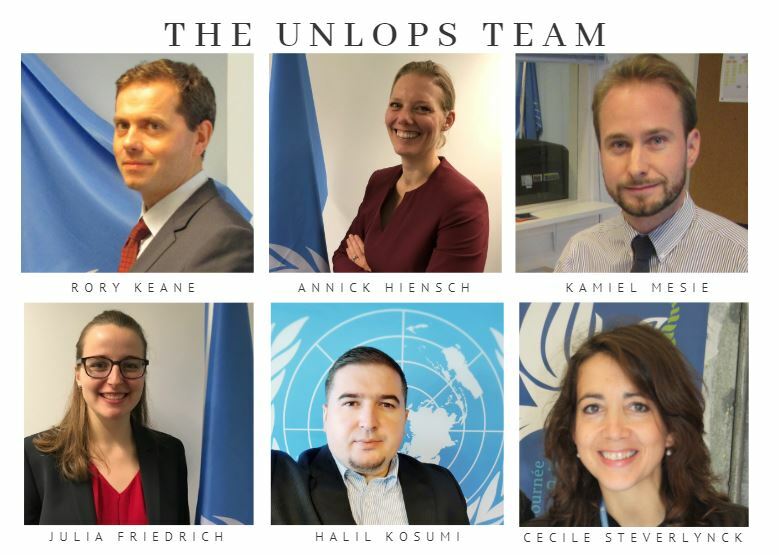 Before his appointment at UNLOPS, Halil worked on global partnerships development with the External Relations and Communications team of the United Nations Volunteers (UNV) Headquarters in Bonn, Germany. Prior to that, he worked with the UN Kosovo team supported by the UNDP, OHCHR, UN Women and the IOM. For seven years he worked for the analysis and reporting cell within the OSCE Mission in Kosovo. He also worked for NGOs in the Balkans region and in the Netherlands. Halil Kosumi holds a LL.M in International Human Rights Law from the University of Essex, United Kingdom and a LL.M. in South East European Law and European Integration from Karl-Franzens University, Austria. He graduated in Law. Halil speaks English, Albanian, Serbian, Bosnian, Croatian and is interested to learn French. Before her appointment at UNLOPS, Cécile Steverlynck worked for the UN Migration Agency, the International Organization for Migration (IOM) Brussels Office, as Reintegration Focal Point. Previously, she served several years in Guatemala with different NGOs, as a technical advisor and consultant, working closely with indigenous populations, MINUGUA and United Nations entities. She also has work experience in the Belgian public sector. Cécile holds a Bachelor degree in communication science and a Master’s degree in Development studies from the Université Catholique de Louvain. She is fluent in French, Dutch, English and Spanish. Before her appointment to UNLOPS, Julia gathered work experience at the Russia and Eurasia program of the Royal Institute of International Affairs Chatham House and the political and economic affairs departments of the German embassy in Kazakhstan. She also worked in the NGO sector in Russia and interned at the German Federal Press Agency and the German parliament.